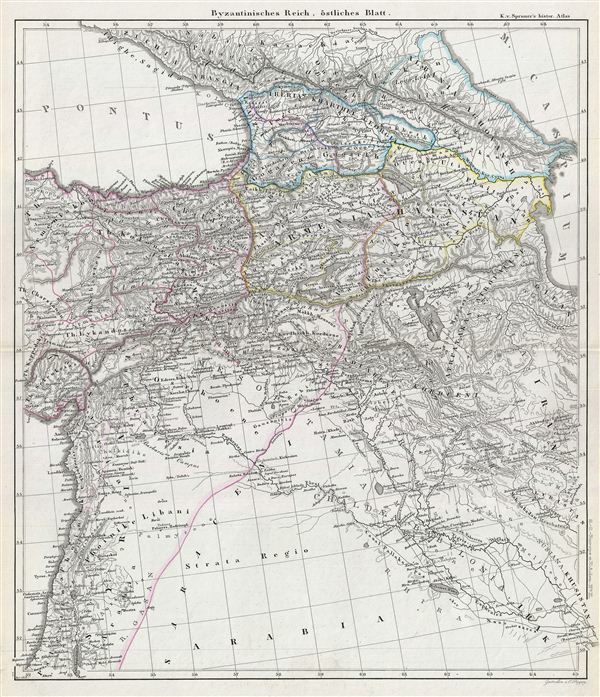 This is Karl von Spruner's 1854 historical map of Asia Minor, Iran, Iraq, and the Caucuses during the hegemony of the Byzantine empire. The map covers from Georgia south to Syria and includes the modern day countries of Turkey, Syria, Georgia, Armenia, Azerbaijan and parts of Iran and Iraq. Asia Minor was considered the heartland of the Byzantine empire during its most powerful years. It was also here that the empire received its greatest blow when the Seljuq Turks first entered Armenia in 1065 and by 1071 succeeded in taking over a majority of the empire's territories. In 1453, the Ottomans managed to take over the capital city of Constantinople, thus marking the end of the Byzantine rule. The whole is rendered in finely engraved detail exhibiting throughout the fine craftsmanship of the Perthes firm. Prepared by Karl Spruner for publication as plate SO II in the second edition of Justus Perthes' 1854 Historich-Geographischer, Hand-Atlas zur Geschichte der Staaten europa's vom Anfang des Mittelalters bis auf die Neueste Zeit.